When it comes to selecting actively managed funds, investors are increasingly wary of high costs and poor relative performance. 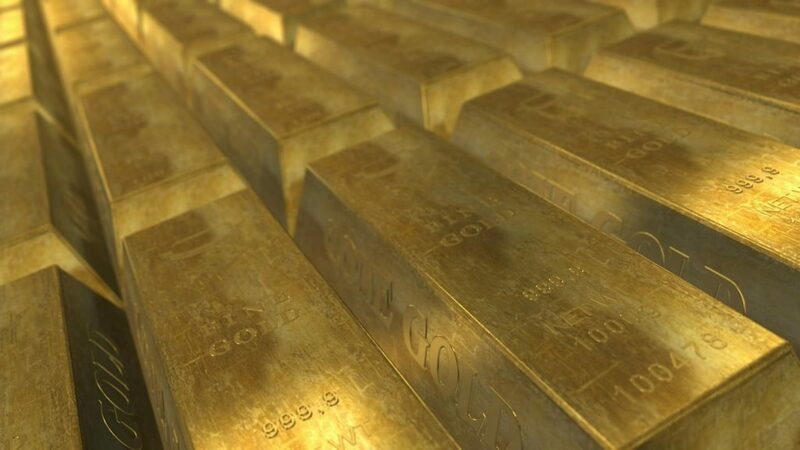 The ever-expanding universe of passive investment solutions continues to offer an attractive and inexpensive alternative. The structure and behaviour of financial markets over the past few years has only supported this debate. Legendary active investor Warren Buffett has made it very clear that he believes a passively managed investment strategy will deliver better results in the long run than those achieved by most investors. Is it as straightforward as it looks? We believe that it is not a case of one or the other, but that it is asset class and market cycle dependent. A dynamically managed multi-manager portfolio will benefit from an allocation to passive as well as actively managed funds. It has not been an easy time for active managers. The recent market environment has caused headwinds for stock pickers across the board, but particularly so in efficient equity markets such as the US and the UK. We therefore believe that passive investment strategies play a ‘core’ role in the portfolios of long-term investors, harnessed in the right manner, at the right time. In less efficient markets such as continental Europe, emerging markets and smaller capitalisation companies, niche active managers can take advantage of a greater opportunity set. The extra management fee often pays for itself as net performance is strong in relative terms. We construct portfolios with a higher strategic allocation to highly active funds in regions where such an opportunity set presents itself. We believe that dynamically blending active with passive will yield the best net of fees results for clients. The challenges of picking a suitable active manager are well known, yet investors are less aware of the due diligence process required to select a passive manager. The predominant advantage of passive strategies is the cost effective market exposure they provide. Depending on the market, net performance can be attractive compared to active management. Empirical evidence shows that passive strategies can perform particularly well relative to active strategies in markets which are efficient or those with higher trading costs. For instance, research by S&P in June 2016 showed that the ability of managers to beat their benchmark was significantly lower for US funds than it was for their European colleagues. Some of the issues to consider carefully when identifying a suitable passive tracker fund are the market exposure gained and its impact on the portfolio’s risk profile, whether the fund is a synthetic replication of the index or buys physical securities (the former introduces counterparty risk which should be on investors’ minds since the 2008 financial crisis) or whether it can perform securities lending and if so, how the investor is compensated. Finally, it is essential to analyse performance net of fees as charges can vary significantly from one provider to the next. It is worth looking closely at the market exposure tracker funds provide – especially those managed to market weighted indices. Market weighted indices can be skewed towards certain industries and/or companies, in the UK for instance, 10 companies amount to 42.8% of the FTSE 100. Whilst this means that passive exposure can work against portfolio diversification, it does also protect relative performance when small sections of the market rally – a phenomenon which is difficult to capture for active managers. 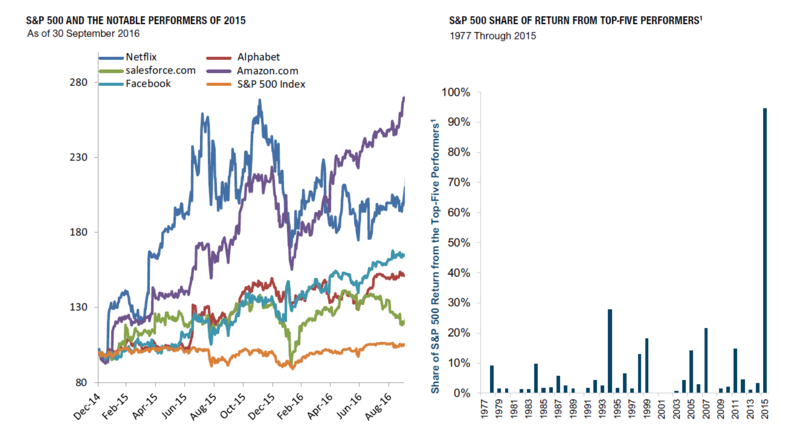 To illustrate this point we show below the performance of the S&P 500 in 2015 when 5 stocks (Facebook, Amazon, Netflix, Google and Salesforce.com) accounted for 96% of the index’s total return. 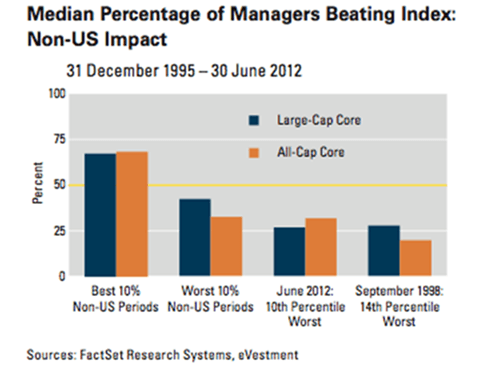 As a result, the majority of active managers who did not have a sizeable allocation to this small cohort did not succeed in delivering outperformance. Looking at the above in the context of our preferred passive and active manager blend within a portfolio, one might consider as a policy that ‘US Large Cap equity’ allocations by default would be 75% passive and 25% active, reflecting the challenges active managers face in aiming to beat the market. It would be the reverse for European equity markets and emerging market equities. The case for active management within a global emerging market equity allocation is twofold: not only is the opportunity set there for active stock pickers, but equity indices also have disproportionate allocations to BRIC (Brazil, Russia, India and China) countries and certain sectors such as energy, materials and financials. Therefore, a strategic long term allocation is most sensibly achieved with a high allocation to active managers who make asset allocation calls based on valuations and prevailing opportunities. This also allows the manager to own stocks like Alibaba and Baidu for instance, which are listed on US exchanges, hence taking them out of any local index tracker altogether. When allocating to passive strategies, investors should keep in mind that traditional passive approaches are essentially momentum bets. Valuations don’t come into play and fresh money inflows are chasing yesterday’s winners. 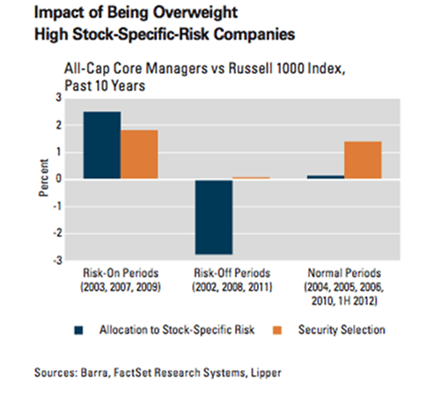 Index buyers are purchasers of stocks that are already overweight and expensive. Smart beta strategy providers have recognised this and have started building index funds weighted according to value, growth, momentum or other style factors. Adopting a passive approach is essentially a decision to outsource stock selection to the market. By extension this decision also assumes that the actions of active managers cause assets to be fairly priced – there are no inefficiencies. It is worth considering what would happen when the tide swings the other way and the majority of equity investment becomes passively managed – then active managers should have more opportunities. A dynamically managed asset allocation and portfolio monitoring approach will support investors in their ongoing assessments of active manager performance and the split between active and passive, depending on cyclical rather than structural influences. Selecting an active manager can be a challenge, as evidenced by the fact that only less than 10% of all funds have positive net relative returns and 20% of the universe has delivered very poor performance indeed. Unsurprisingly, the spread of relative returns can be significant, and – depending on the market – certain style biases have historically shown stronger relative returns than others (for instance Growth managers in the US equity markets and Income focussed managers in the UK). Investors must differentiate between managers producing true alpha and those generating market beta disguised as alpha (by making asset allocation calls rather than bottom up stock selection). For example, a fund investing in US large cap stocks should generate all alpha from large caps rather than through broad index exposure or a tactical allocation to small caps when the large cap opportunity set is challenging. With our team of 16 investment research and portfolio management professionals based in London, Madrid and Miami, possible style drifts are only one of several factors we look at. Our due diligence process combines quantitative with qualitative analysis to identify potential investments across all asset classes. Initial screens of our proprietary research data base and industry network typically produce a long list on which detailed quantitative and qualitative assessments are undertaken, which consider performance, risk, correlation and underlying investment exposures. Combined with thorough in house operational due diligence, we form a final opinion on active managers which we believe will deliver alpha. 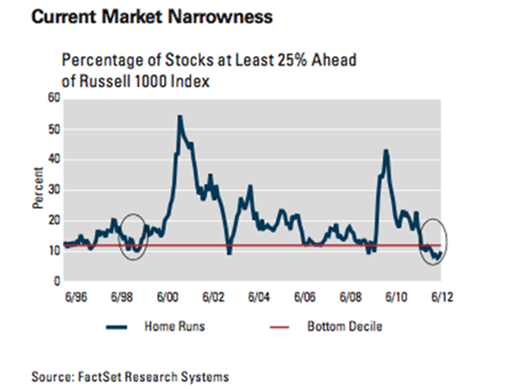 Narrowness of the market – when returns are concentrated in a handful of stocks, sectors or geographical locations which makes bottom up stock selection more challenging. The broader the market the more opportunities for the active managers to identify stocks that will add value. Performance differential between US and non-US markets can affect relative performance for equity managers who make asset allocation calls outside their regions (such as ex US exposure for US managers or being under- or overweight US exposure for a global equity manager) – proving to be a drag on performance for both US and non-US managers if the other region heavily underperforms. The chart below demonstrates that the better the performance of non US markets over the period reviewed, the greater the number of managers outperforming. Individual stock returns are dispersed rather than correlated. Essentially, active managers are looking for stock specific risk and as markets move in lock step (in downturns or sharp recoveries) the discerning stock picking of active managers can be overwhelmed by the coordinated movement of the market as a whole. The chart below illustrates how security selection was positive over the period reviewed but allocation decisions were greater in extreme markets, in particular in risk off periods. Not dissimilar to the late 1990s – the current market environment is offering active managers a limited opportunity set. The trend of passive allocations can lead to distortions being sustained, or even magnified, as regions, stocks and sectors that have posted the strongest returns are allocated increasing proportions of new capital rather than the market being re-balanced by valuation sensitive investors. Research therefore suggests focusing on high active share strategies as crucial to identifying suitable active managers. In order to diversify the higher risk of these often highly concentrated portfolios, investors should consider a risk based framework for the active equity allocation and combine high active share managers with a core/passive approach and diversify manager risk by selecting both fundamental and quantitative strategies. Bond indices are constructed differently, allocating the largest exposure in the index to the most indebted issuers. We believe this makes passive allocation in this asset class inherently more risky, so investors should consider more than the amount of debt outstanding when allocating capital to the debt markets. Investors are also exposed to interest rate risk, and credit quality changes within the index as issuance trends evolve. Effectively managing these exposures through passive allocations can be difficult. With the exception of government debt allocations, we believe credit exposure is best achieved through active strategies. As the credit rating of issuers changes, the segmented nature of the fixed income markets can lead to very significant volatility in the pricing and liquidity of issuers in short order. Investors in this space are broadly split between those willing to hold higher quality debt investments (‘Investment grade’) and investors willing to accept lower credit quality debt in return for a higher interest rate (‘high yield’). The segment of the market in which a bond lies depends on the ratings provided by the ratings agencies. As corporate fortunes change, so do the credit ratings and this can lead to upgrading and downgrading of debt securities. Investors are most concerned by downgrading, or deteriorating credit. 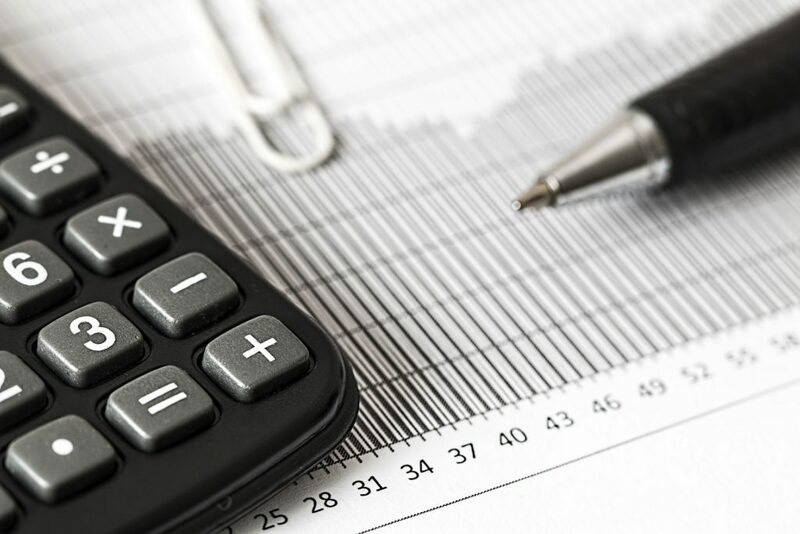 Issuers being downgraded can incur cost to investors as the stocks transition between one classification and the other – with forced sellers and buyers on both sides leading to price volatility and often capital losses for the sellers. Passive investors pay too high a price for ignoring these market factors, as active management takes advantage of these well-known inefficiencies. A dynamically managed, blended approach combining passive and actively managed funds should both lower investors’ annual management fees while avoid underperformance over the course of a whole market cycle. A dogmatic approach rooted in either the passive or active camp would only hinder the return potential of an investment portfolio. We encourage investors to focus on the net of fees returns provided by any given strategy, after all, this is the driver of portfolio wealth. A sole focus on low fee implementation if it is to the detriment of overall net returns is a false economy. In the current market environment, 8 years into a recovery and a consensus agreement that asset price valuations are elevated, the importance of selecting active managers that can take advantage of market dislocations is paramount. 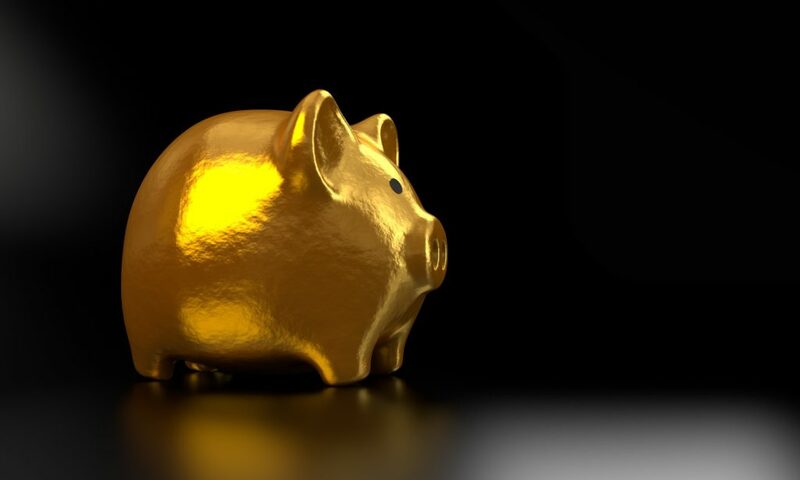 We believe investors should consider a ‘strategic’ allocation to passive investments in each section of their portfolios, and vary the balance of active and passive management allocations on a tactical basis based on their expectations of market breadth, efficiency, momentum and valuations, among other factors. Going back to the example of the S&P study of US large cap versus European equity managers – one might consider that the US large cap equity allocation by default would be 75% passive, reflecting the difficulty that active strategies have shown in beating this market. However, for European equities, history has shown that the market is more inefficient, less prone to ‘narrow’ rallies and a more conducive environment for active management. In this case, the default passive allocation may be 25%. Finally, investors should consider a sterner hurdle for the inclusion of active management funds in their portfolio. 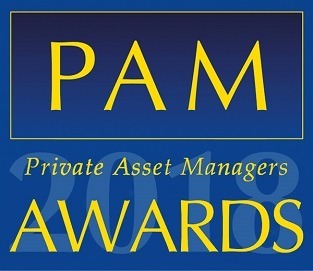 They should view the decision to apply active strategies as a budgeted process, where one is happy to use a finite risk allocation on active management – focusing only on managers with the highest active share and conviction – avoiding closet index trackers which charge active management fees for indexed performance.